In this post I’ll present a suggested design pattern and implementation for this design pattern using a Node + Express REST API with ES Classes. Personally, I hate writing the same code again and again. It violates the DRY principle and I hate to waste my time and my customers’ time. Being a C++ developer in background, I love a nice class design. In today’s microservices and web, REST endpoints have become somewhat of the de-facto way to connect services and web applications. There are loads of examples how to create REST endpoints and servers using Node.js and Express 4.0. SOAP, which was popular a while back, has given way to JSON. New technologies like GraphQL have not made it to mainstream yet, so for now we are stuck with REST and JSON. I haven’t found a tutorial that discusses how to do this using ES6 classes and a good class design. This is what we will cover today. Then I’ll create the server.js main file (we won’t discuss this in detail, as it’s mostly a node/express server. The one line that’s important to note is require('./routes/index')(server,db); as this will create all the routes for our application). I’m using require-dir which will include all route handlers. I wanted each route to handle it’s own paths, and not the global paths (I like encapsulation). So as a design decision I made the filename the subroute file. 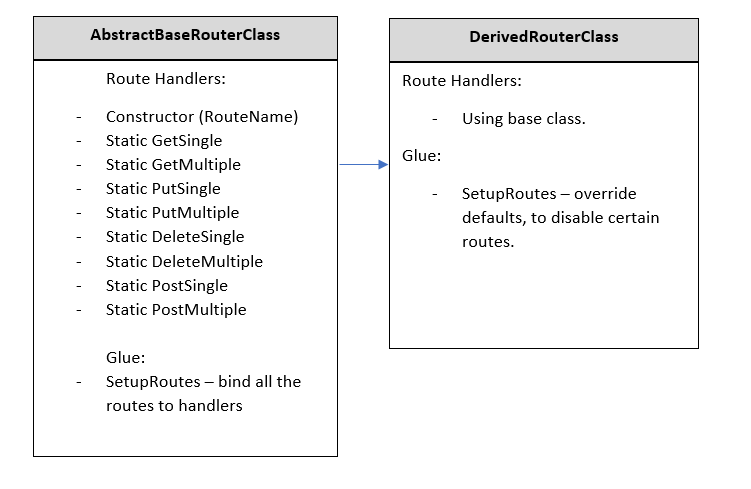 I then create an instance of the route handler class, passing it a reference to the dbDB (so it can do it’s thing). setupRoutes() returns a router, which I then connect to our server. I’m building on server.use of the express router , to bind routes to the baseurl. If you adpot this impementation you can always use your own structure. I wanted to use generators, as I like their async / await like structure. So I wrote a co-wrapper file that will handle errors and the generators’ routes correctly, including wrapping with a promise. I do not wish to go into depths explaining it, as it’s not the point of this post. But you can see this file, in the git repo. Let’s create a ‘route-handlers’ folder inside the ‘routes’ folder and add a file called companies.js. First look at how easy it was to create a new route. We didn’t need to write even this much code. We could just create the constructor and be done with it, if we wanted the same behaviour as the base class.